I had my worst hypoglycemia episode in 2005 just before moving to Chicago. I had sold my Pastry Workshop in 1 hour and was ready to change my life to move to Chicago to pursue my dreams to study a Pastry program abroad. It was a very stressful 2 months to say the least. I fainted and blacked out in the movies and my blood sugar was at 45 .. the lowest level ever. I could not even get on a wheel chair and I felt terrible for weeks. After seeking help, I ended up finding a holistic doctor, an iridiologist and a healer who learned with the chamanes from Chihuahua. He told me I needed to re frame my life completely and that I needed to do something totally different. He told me I was pre diabetic and that I should not eat: dairy, gluten, commercial meat or chicken, farm raised fish or sugars. So besides changing the way I ate and lived (I was 100 % focused on work and my professional life was EVERYTHING) I had to create a new way of baking. I was determined to create 1 recipe that I could eat. 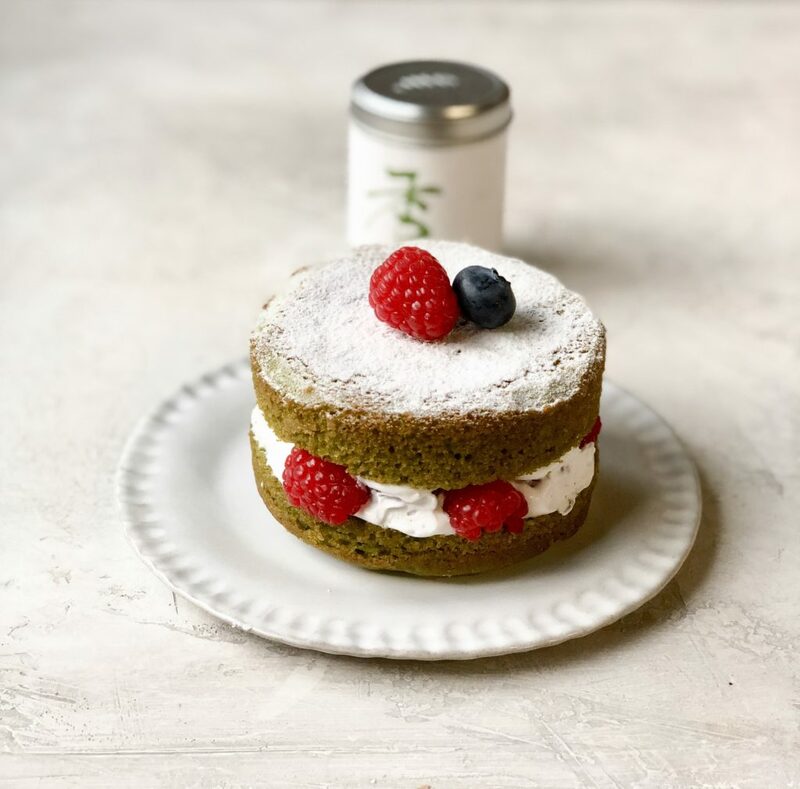 So in one of my consulting projects I had tasted the famous Matcha Cake from Carolo and I knew I wanted to recreate it in a healthy way: eliminating flours, grains, refined sugar and this new version of that original recipe is now grain free and paleo! Moist, super easy, light, pairs with many fillings, can be made so many ways: naked cake, cupcakes, travel cake, sheet cake. Subscribe to my YouTube: then check the video for the step by step to make this recipe! Enjoy! Happy Baking! If you make this recipe please share on Instagram and tag me @chefvanessamusi #noblebaking so I can share your creations. Make this cake! It's life changing! Moist, fresh, spongy, lasts for many days, fill it with berries, apricots, chocolate ganache, whipped cream. Even non matcha lovers will love it! If you DON'T love matcha turn it into a lemon or orange cake. 2 cans of coconut milk (the best ones are Whole Foods 365 brand organic) chill for 2 days unopened in your fridge. Open and remove the thick part ONLY! Add 1 pinch vanilla powder (not vanilla extract as it will turn brown) add a pinch of ses salt I like Maldon Salt. Store cream well covered in fridge until ready to use it keeps well for about 3 days. Grease 2, 6 inch round cake pans with coconut spray and line with parchment paper. Preheat convection oven to 345 F, a regular oven to 350 F.
Sift flours and baking powder, salt and matcha. In a KitchenAid mixer with a whisk, beat eggs, vanilla and maple syrup, beat until airy and lemon color. Add the oil and mix until combined. Add coconut cream and mix. Add the sifted flour. Mix to combine. Don’t over mix. Pour batter into prepared pans. Bake for aprox 15 mins until a toothpick comes out clean approx. 25-30 mins depending on your oven. Remove from oven, let cool on rack. Remove cakes from pans. Cool on rack. Fill cake with cream, fill with berries and decorate the top with coconut milk powder. Sift flours and mix with a whisk. Measure how much the recipe calls for. Save the rest. Hey Buddy!, I found this information for you: "PALEO MATCHA CAKE". Here is the website link: https://www.vanessamusi.com/paleo-matcha-cake/. Thank you.